Sorry, it's certainly not the Victorian era. 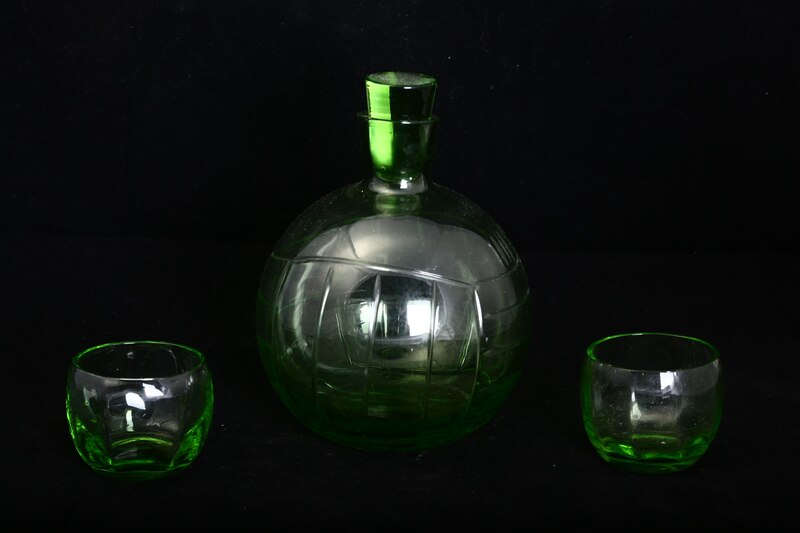 But I drove to the store-the flea market and bought a decanter green glass. Is now on the table, waiting for me to wash it. And it beckons, beckons. What I would have it poured and then poured the glasses. I may be able to make the country something. Something like brandy. Something like Calvados. One day I probably will. And poured into a decanter. I have one blue glass very like those - will have to keep an eye out for a decanter, and more glasses! Out of a thirst for the truth. This is a good picture of the seller. Not on a black background, the color is not very saturated. But still green. And as he lay down comfortably in the hand. It is not big, just on the palm of your hand. My blue one isn't very big either. It just sits nicely in the hand. Could those be uranium glass? I'd like to see them under UV light. I also thought this thought. In the next few days I can check. But honestly I doubt. 1) Simple green color. The uranium glass that I saw in the pictures, as a rule, has a yellowish tinge. 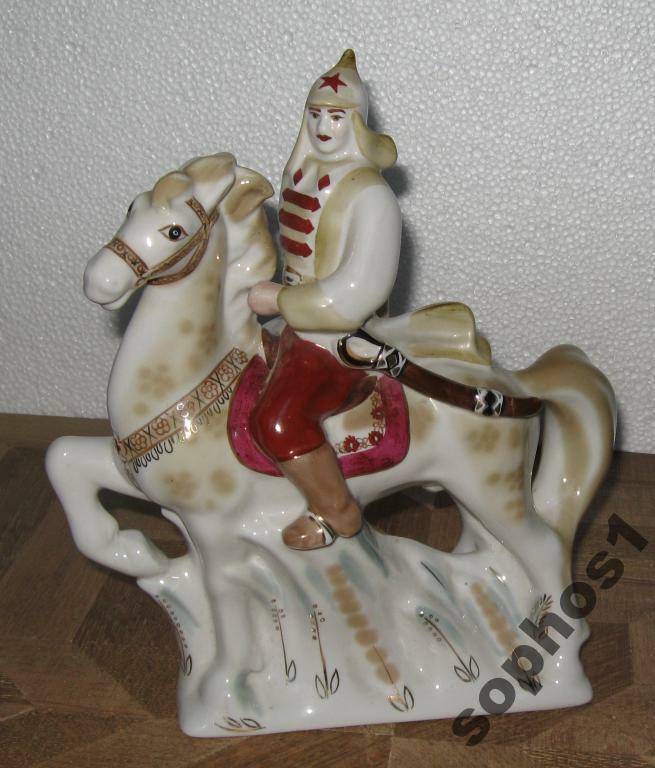 2) All the same, I bought it in a flea market, I think his team has the skills and knowledge. They sort things by value. But if I'm lucky, and the glass is uranium, I'll write about it. And yet, earlier, I bought another carafe, it's just a yellowish shade. Hmm, maybe I'm becoming an antiquarian. That's not 'just an idea'; I'd call it genius! Vintage shop on Colchester High Street yesterday. Perfect fit on my 44" chest. Went out on a limb, bought these three antique prosthetic legs at a charity shop here in France. I may decorate the one with the foot, in the style of Old School Tattoos, i.e. Galleons, Anchors etc. Technically not a flea-market find. These are probably the two finest ray gun toys ever manufactured. 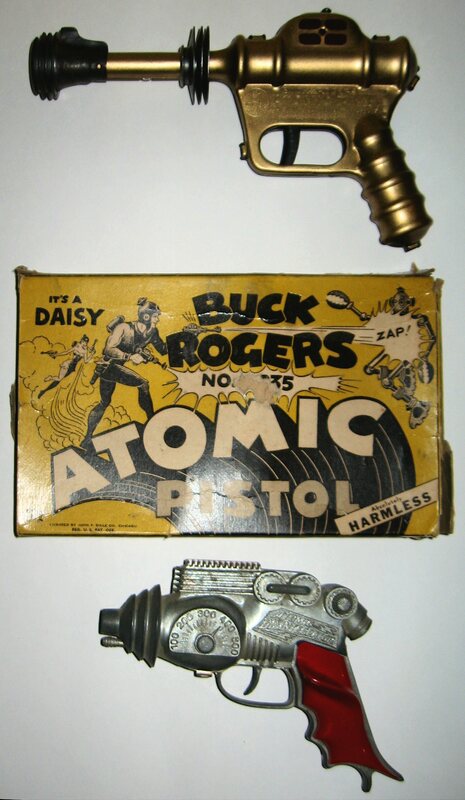 The Buck Rogers U-235 Atomic Pistol is probably the first toy ray gun ever. First manufactured in the 1930's by Daisy, a company probably better known for its BB guns. The artist for the Buck Rogers newspaper strips redesigned Buck's pistol to be more easily manufactured, with the result being one of the first licensed toy to be completely authentic to the appearance of the object in the source material. The gun is metal, and has a satisfactory heft to it when you hold it in your hand. The Hubley Atomic Disintegrator was produced circa 1950, and is, in my opinion, the best looking ray gun ever produced by a toy company. Notice the grips, meters, and knobs? Weta Workshop has copied them for their line of ray guns. In addition to just being really cool looking, it fires roll caps. I acquired both in the last few days through my comic shop; the Buck Rogers gun was brought into the store by a seller with some other really exceptional comic book related collectibles. After the purchase and upon examination of some of the items, my business partner noticed a local address on an Edgar Rice Burroughs fanzine. It was a woman's name on the label, and an address very close to the store. My partner decided to pay a visit; I advised him to bring one of our female employees with him as it would make him less intimidating when he showed up on an elderly woman's doorstep. The resident was the subscriber to the fanzine; a very elderly woman who had collected pop cultural items with her husband and her son, both of whom she had outlived. Her house was packed with her son's possessions including a very impressive collection of vintage toys and comic related items. She had been giving the stuff away to people who visited her, and some of the finest things that my store had ever purchased from drop-in sellers had come out of this house. So we made her a sizable offer and she was thrilled to have cash for what she had been giving away, and while I was packing up the contents of her attic, I found the Hubley gun on the floor among some wood scraps. Thanks!, I worry about my sanity sometimes!, I'll be sure to post in tactile when it is done, the other two will go up for sale as they were found, as for the puns, I take them all in my stride! Pirate galleons, perhaps? To show off their booty! No rush, one step at a time. Can anyone advise me on how to preserve that dust jacket to keep it from crumbling away? Well I'm not a paper or book conservator, but if I remember my training rightly, the best way would be 'wrap' it in some form of plastic so as to protect it from both dust and handling. If you're going to store it on a bookshelf or similar a cardboard 'sleeve' (think sort of like a VHS cassette box) around three or more sides would also help protect it. I may well post back later when I've had chance to read the relevant section in my housekeeping manual. The kevlar bags used for roasting poultry will keep it safe & sound - properly sealed, that is. It's the same stuff as archivists use to store documents in. It's ph neutral, so no acid and no alkali. I've used it when working in a school archive, and in libraries. That's a possibility, but entirely sealing it in a bag risks creating a micro-climate in anything other than the sort of strict environmental controlled spaces you'd find in a dedicated archive. The best advice I can give, at least, according to our book conservators is to wrap it in conservation grade tissue and store it in a 'phase box' (again made from conservation grade materials).